1 Turner, Crillee Maximus The Cool. 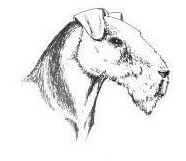 Rangy dog, good head, liked his forehand, should shorten with age, long neck, moved and showed well. 2 Milkovics, Wederdenas Stargazer. Did not settle on the day, long reach of neck, moved well behind. 1 Ablard's Katherines Land Vip Lover (ATCAS01785EST). Very good head and ears, strong muzzle, okay topline, not moving good today, in lovely jacket. 1 Lee, Stargus Allegro. Won this class with ease, eye catching, bold dog of quality and type, grand head and ears, excellent substance, strong neck, well laid shoulders, big spring of rib, well built quarters going into very good bend of stifle and low hocks, looked a picture, in grand bloom, coat in A1 condition, moved with drive. CC & BoB. 2 Atkinson's Jokyl Party Popper. Classic head and ears, good neck and shoulders, stood all four square, moved and showed well to earn his place. Res CC. 3 Hill's Ch Crillee Catch Of The Day With Gillaire. 1 Wendelberger-James & James, Saffronstars's Stargazer ShCM. Nice to see the old boy enjoying his day out, moved well, true front. 1 Wendelberger-James & James, Saffronstars's Stargazer ShCM. 1 Johnstone, Jecadie Just A Spicy Sparkler. Neat head and ears, long neck, good body, moved okay, showed well. 2 Turner's Crillee Cool Wishes. Good head, nice eyes, very good type, not putting all in today, moved well. 1 Toulson, Toulsyork Nefarious. Long head, excellent coat, well off for substance, moved well. 1 Hampton & Hall, Muliebrity Enchanted Bay. Little on the fine side for me, moved well, showing all the time. 1 Collins, Colldale Ring Of Fire. The size I like, good type, substance and elegance, good head and ears, excellent topline, moved and showed well, in good condition. 2 Turner, Crillee Carry On Maybe Baby. Long head going into long neck, not the topline of 1st, showing well. 3 Eastall's Brislines Born In The Usa For Daedal (Imp USA) Sh CM. 1 Moules, Doraemi One Vision Sh CM. Very good head and ear carriage, true front, long neck, level topline, good quarters, moved really well, showing all the time, handler brought the best out of her. CC. 2 Hampton & Hall's Muliebrity Harmony. Ideal size, neat head and ears, lot of substance, good spring of rib, moved and showed well. Res CC. 3 Swash, Jokyl Red Letter Day. 1 Johnstone, Ch Jecadie Dipped In Spice. Ideal size, good head and ears which she used well, very good outline, in super coat and condition. 2 Steinke's Wendaire Jokers Zulu Angel. Pleasing head and ears, good topline, in fine coat, moved okay.